Recently my daughter and I were at the Anthropologie store in Salt Lake City admiring all the amazing products and displays. They had a framed chalk art that caught my eye. 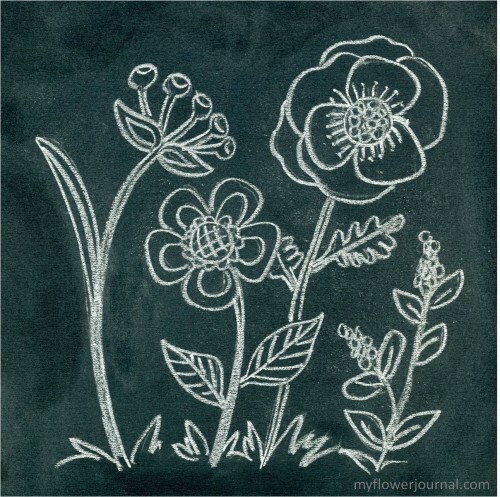 I have done quotes on my chalkboard, but hadn’t thought of doing a flower drawing. So I went home and got my chalkboard out. 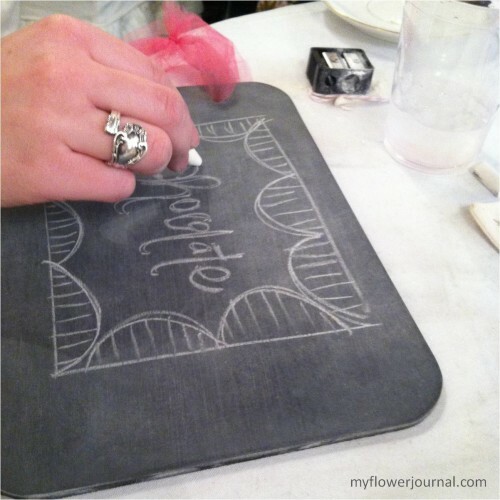 Here is my Anthropologie inspired flower chalk art and how I did it! 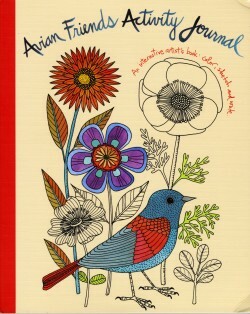 I drew my flowers after looking through Avian Friends Activity Journal. These line drawings by Geninne Zlatkis are great for variety art projects. After I did my drawing on paper I transferred it to my chalkboard. I’ll show you how I did this. 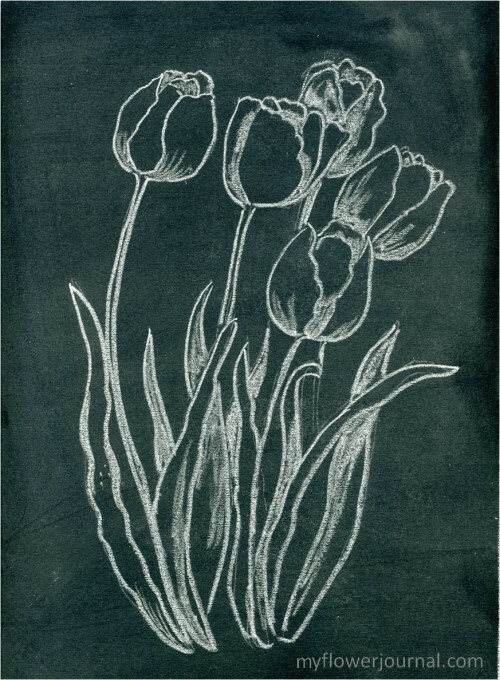 This is another flower chalk art I did. 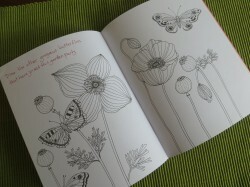 I got the flower design from Treasury of Flower Designs. 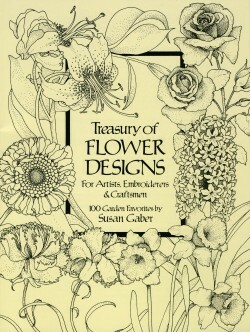 This is another good book to own if you like to include flowers in your art or craft projects. 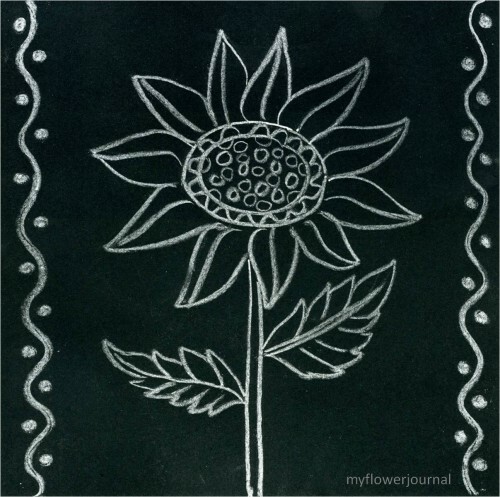 In January my daughters and I took a chalkboard art class from Rhonna Farrer. Her class was so popular she created an online version you can do from home. You learn lots of chalk art tips and how to do fun borders and lettering. One important thing I learned in her class was to sharpen my chalk to get a fine line for detail. I didn’t know you could sharpen chalk! It doesn’t matter what kind of chalk you use, but you need a sharpener with an extra large opening. You can find them in the makeup or school supply section at Walmart. I bought and tried a few until I found one I really liked. Sharp chalk is important for creating these designs. 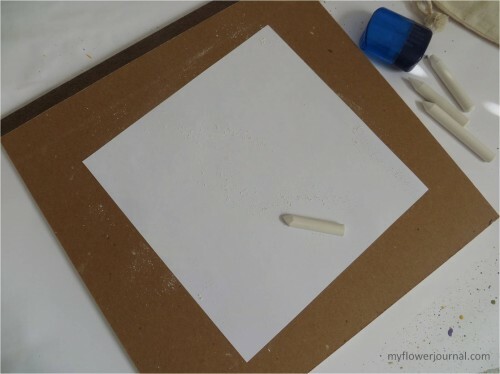 You will need to sharpen your chalk often because the fine tip wears down quickly. 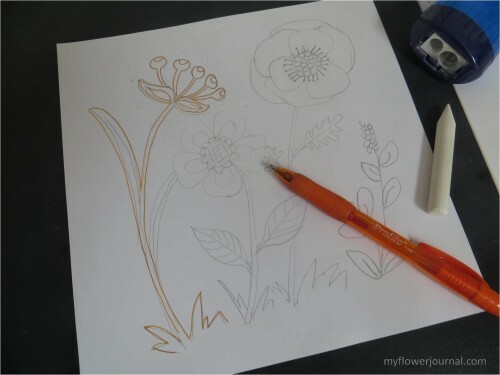 1.Choose a design and make a copy of it or sketch your own on a piece of paper. 2.Turn the paper over and rub chalk all over the back of it. 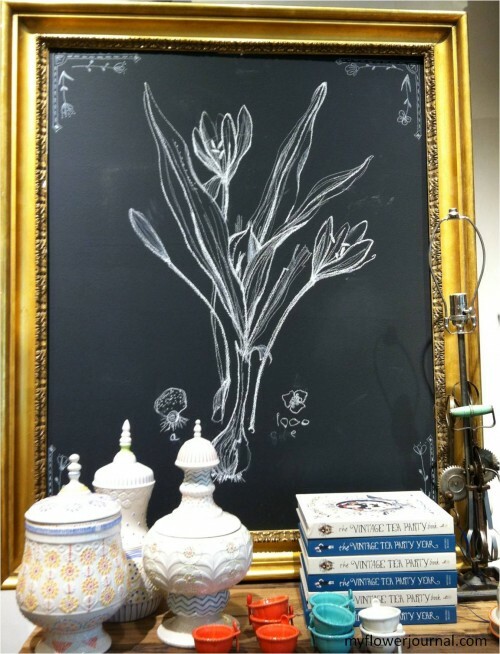 3.Lay your design on your chalkboard getting it centered where you want it. Draw over your design with a colored pen. I like to use a colored pen because I can tell what part I have done. 4.When you are through lift the paper off and you will see a light copy of your design. 5.Go over it with a sharp piece of chalk. Don’t get too uptight if its not perfect. Its chalk! You can always erase it and start over. If you love your chalk art and you don’t ever want to erase it you can spray it with a permanent fixative so it won’t rub off. 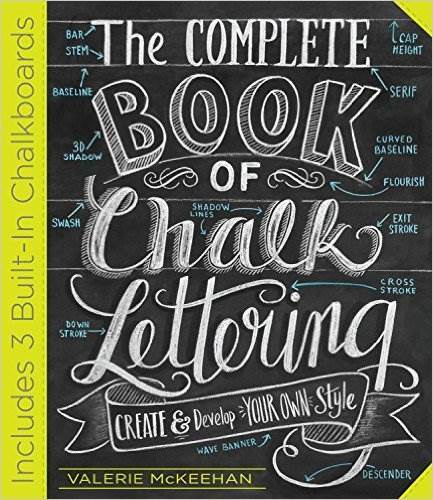 If you want to learn more about chalk art and lettering this book is a winner! Those are all great ideas! Thanks so much for sharing them with us. I have pinned your post so I can remember these chalk drawing/lettering tips. I saw your post over at Marty’s blog A Stroll Thru Life. Well I never knew you could sharpen chalk either! I might have to copy these for my kitchen door, that I just painted with chalkboard paint. Well who KNEW you could sharpen chalk ! : ) These books make me want to get colored pencils out and color : ) I had to click on the one link as I thought it might be a Dover book. I remember getting a book like that for my boys at some point..it was Native Americans or a similar history type book and I think that I colored a page too. These would be nice for embroidery as well ( If I could do more than a back stitch! :) It’s always fun to visit here. LOVE this!!! I never knew you could sharpen chalk!!! What a great idea. Of course, I’d have to have my husband do the drawing part – he’s the artist in the family. But I really love this project. I can see how my eight year-old daughter would like to do something similar for her bedroom, too. Visiting from Tweak It Tuesday! I’m a BIG Anthropologie fan! Love your tutorial and chalk art! What a fun change from the usual chalkboard quote! Great tutorial too. I live near SLC also and you are making me want to head over to Anthro for more inspiration. Thx for sharing this! Pinning for future reference! I LOVE this! Can’t wait to try it out. And thank you for the book recommendations. I’ve never hear of either one. I know what I’ll be ordering soon. Your flowers were gorgeous! Have a great day! Hi, I love this and you are so talented! It is so pretty. I saw it on I gotta create. Thanks for sharing this post with us at the BeBetsy Brag About It party and hope to see you next week! I always wondered how people got such perfect images! Now I know! Thanks! Lovely! Thank you for sharing. Pinning! You are such an artist. Your artwork is beautiful. Anthropologie needs you on their team. Thanks for sharing the sharpening tip! Love the piece with the tulips – gorgeous! I would never have thought to sharpen chalk before reading this post, so thank you so much for sharing that tip! How lovely! Thanks so much for showing us how to do these great chalk drawings! 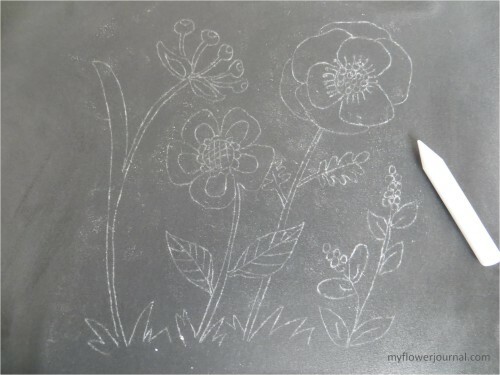 I have drawn little sketches on my chalkboard, but nothing so stunning as this. I certainly will be heading to Wal-Mart to get a sharpener. Thanks for sharing this tip with SYC.